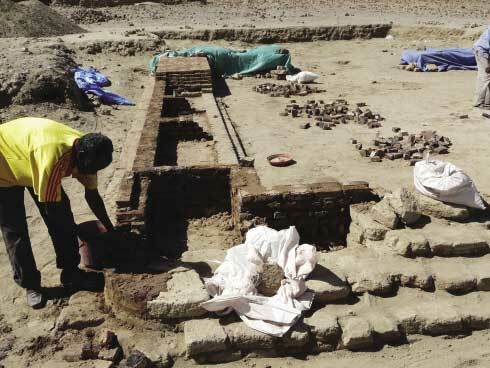 Excavation of a 2000 year old Amun Temple at Dangeil in Sudan. Under the directorship of Drs Salah Mohammed Ahmed of the National Corporation for Antiquities and Museums, Khartoum and Julie R Anderson of the British Museum, London an excavation of the temple commenced in 2000. Dangeil is located to the south of the 5th Nile cataract in Sudan. In 2008, a preliminary visit was organised to intiate a conservation programme and trials to the architectural fabric of the temple. The materials used in the temple's construction include mud brick, fired brick, lime plaster and sandstone. During the subsequent seasons following 2008 adjustments and evaluations of the previous year's completed trials have been assessed. This case study outlines the progress of the site to date. Words in the article text followed by an asterisk (*) are explained in the glossary at the end of the article. 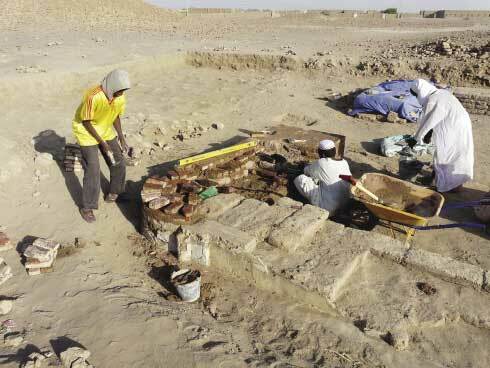 The excavation of a 2000-year old Amun temple at Dangeil began in 2000 under the directorship of Drs Salah Mohamed Ahmed and Julie R. Anderson of the National Corporation for Antiquities and Museums (NCAM), Sudan and the British Museum, UK, respectively. 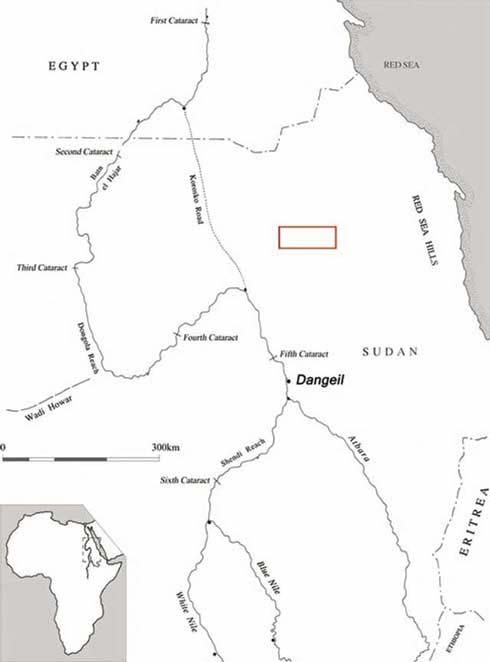 Dangeil is a small village located south of the 5 Nile cataract in Sudan (figure 1). In 2007, it was decided to investigate and assess a number of options to provide a conservation programme for the long-term preservation of the site. 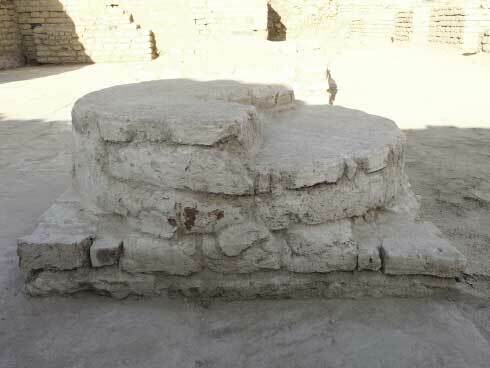 In 2008, a preliminary visit was organised to initiate a number of trials on various aspects of the architectural fabric of the site. The materials used in the temple’s construction include mud brick, fired brick, lime plaster and sandstone (Anderson 2009; Anderson et al. 2007; Anderson and Salah 2010a, 2010b, 2009, 2008, 2006-7, 2006a, 2006b, 2006c, 2002a, 2002b, 1998-2002). The weather and climate of the area have been strong elements in planning the conservation of this site. The summers are extremely hot and dry and the winters can produce periods of heavy rain and strong winds. So the period for the project falls into a two-month window – October and November. The subsequent seasons have now provided a history of information on the preceding years’ trial areas. This has enabled us to evaluate the methods and treatments used and to adjust them where necessary. Geographically, the 5th cataract to the north of Abidiya forms an imposing natural boundary that inhibits movement along the river and may have delineated other borders in the past, including political, cultural, and/or linguistic ones. Geologically, the right bank is primarily comprised of an undifferentiated basement complex and schist, while the left bank of metasediments, hornblende gneisses and schists, and some volcanic basalts. The Berber-Abidiya area is also situated on the hub of both ancient and modern trade routes, with riverine traffic either initiating or concluding their portages in this region in order to avoid the 5 cataract. Routes from the eastern and western deserts and the Red Sea also connect with the Nile in this vicinity. Limited archaeological work has been conducted in this area. A few antiquities and sites were identified by the Turkish Army and early travellers in the 19th and early 20th centuries, but a detailed scientific survey and study of the region has yet to be conducted. The character, distribution, density and length of occupation are not known. Our reconnaissance revealed numerous archaeological sites ranging in date from the Late Kushite period (3rd c BC- 4th c AD) to those of the Islamic period (18th -19th century). 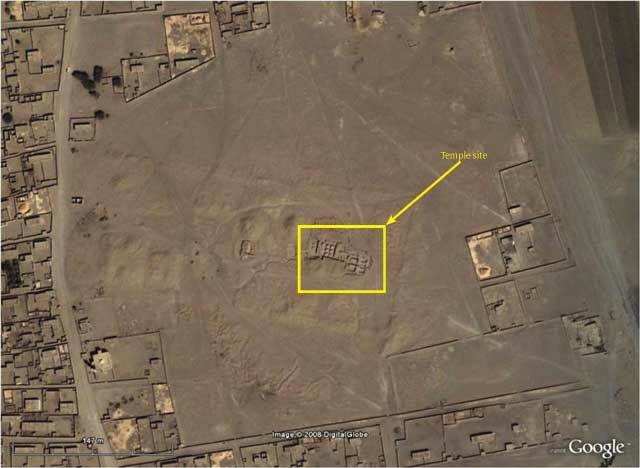 These include several cemeteries and a large ferricrete sandstone fortress of the 4 and 5 centuries AD, the Kushite settlement of Dangeil (figure 2), a medieval Christian cemetery, and a 19th century Islamic Mahdiya watch post. It is an archaeologically rich region (Anderson 2009; Anderson et al. 2007; Anderson and Salah 2010a, 2010b, 2009, 2008, 2006-7, 2006a, 2006b, 2006c, 2002a, 2002b, 1998-2002). Fig. 2: Aerial view of Dangeil Temple site. Dangeil is situated in northern Sudan on the right bank of the Nile, roughly 350 km north of Khartoum. The site consists of several mounds covered with fragments of red brick, sandstone, ceramics, plaster, etc. 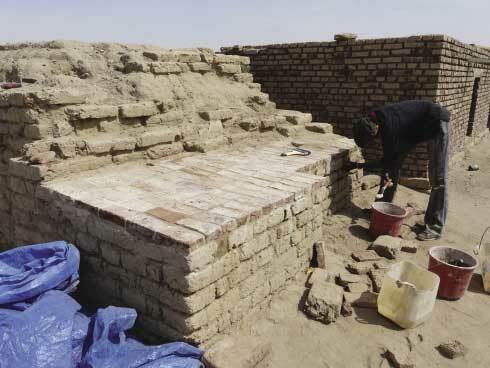 Excavations have focused on the central part of the site where a large, well-preserved Amun temple has been discovered. 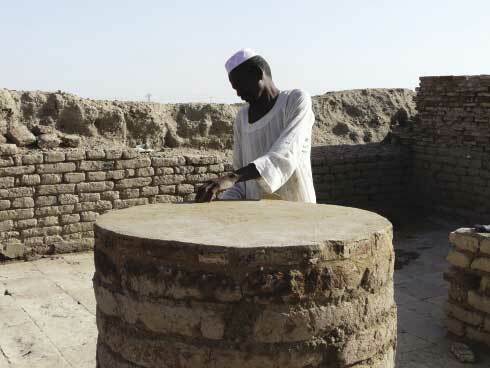 Much of the ancient built environment at Dangeil has survived and as such the site represents an important and unique part of Sudan’s cultural heritage. The mission’s major goals are to preserve, conserve and protect the site for the future using affordable locally sourced materials and trained local labour force, to promote understanding of the site’s cultural significance, and ultimately to make the temple accessible to visitors. 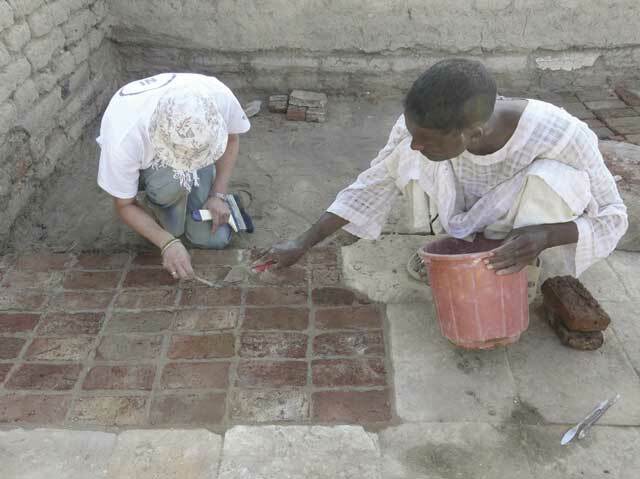 To assist in achieving these goals, a capacity building programme has been initiated wherein personnel from NCAM, students from the University of Khartoum and local Dangeil personnel are trained in excavation and conservation techniques and materials (Anderson 2009; Anderson et al. 2007; Anderson and Salah 2010a, 2010b, 2009, 2008, 2006-7, 2006a, 2006b, 2006c, 2002a, 2002b, 1998-2002). The temple (48.5 x 33.5 m) is orientated east-west, in the desert on the edge with cultivated land, with the entrance facing the Nile. Most walls are a metre wide and preserved to a standing height between 1.5 and 3 metres. The basic unit of measurement used in construction was the Egyptian cubit (c. 52.3 cm) and it is evident that the structure was laid out precisely. The measurements reveal clear harmonic proportions, symmetry and regular architectural planning principles (Anderson 2009; Anderson et al. 2007; Anderson and Salah 2010a, 2010b, 2009, 2008, 2006-7, 2006a, 2006b, 2006c, 2002a, 2002b, 1998-2002). A mixture of materials including sandstone (quartz arenite), fired red brick and sundried mud brick were used in the temple’s construction. Most walls have red brick foundations with the upper parts consisting of a mud brick core, faced on the exterior with red bricks. 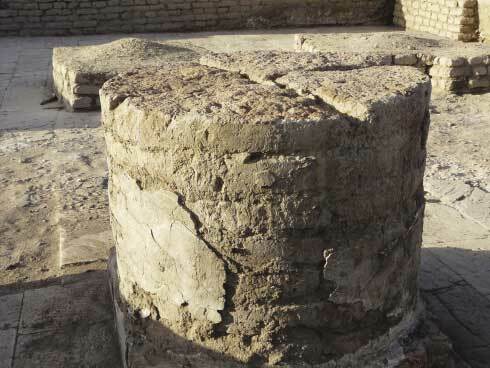 Column drums in the courts were created from red brick quarter circles or thirds, sandwiched together with mud mortar. The floor surfaces, sanctuary columns and wall facings are made of sandstone. Fine chisel marks on the external surfaces of the sandstone indicate that many blocks had been prepared for a finishing layer of painted lime plaster. The wall surfaces had been covered with a white-washed mud plaster which was painted yellow, red, robins’ egg blue or some combination thereof. The pigments used have been identified by Raman spectroscopy with the red and yellow being hematite and a highly crystalline goethite respectively, and the blue, a calcium copper silicate (CaCuSi4O10) commonly known as Egyptian blue. 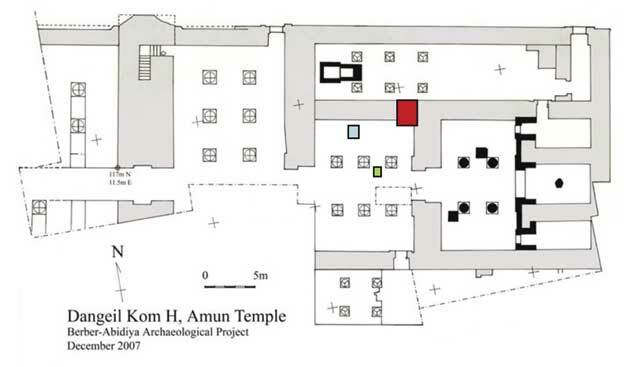 The temple was destroyed by fire and Accelerator Mass Spectrometry (AMS) and C14 dating of the charred roof beams have placed construction of the most recent incarnation of the temple in the 1 century AD. This date is further confirmed by the associated ceramics and inscriptions. Following its destruction, the temple gradually decayed and collapsed. An initial working visit to Dangeil was organised in November 2008 to establish principles and assess possible conservation options. In discussion with the site directors, the conservation brief and goals for the site were established. The decay mechanisms affecting the architectural elements of the site were identified as: the inherent fragility of the building materials; the poor quality of the sandstone, with little cementing material around the particles; and the exposed mud and fired brick’s vulnerability to ingress of water from the short seasonal heavy rain. The site sits in the centre of the kom and is used as an access route from one side of the village to the other. This includes not only human footfall but also animal, which has caused some physical damage to the archaeological material in the past. To reduce this, a natural barrier of a dried thorny shrub has been scattered around the perimeter of the site. This discourages the animal element, and to some extent, human passage. The first visit in 2008 was intended to establish the locations and extent of the trials, the materials to be used, and to discuss the aesthetic appearance of the finished work. It was agreed that the main aim of the project was to preserve the site’s long-term future and any materials used in the site’s conservation or maintenance should distinguish from the ancient ones (Severson 2001). It is important that the materials used are relatively easy to remove in case of future, changes in aesthetic taste or developments in conservation treatments. The main priority is to use materials that are sympathetic to the original structures (Northern Ireland Environment Agency; Pavía and Bolton 2000) and do not affect the archaeological remains or provoke further deterioration (Kemp 2006: 231). In addition, it is important that the materials used are sourced locally and that the conservation methods are not too complex so as to allow the continued long term care of the site by an appropriately trained local work force. It is also important that any work can be removed easily without compromising the archaeological remains and that a solution is found to prevent the continuing cycle of loss of original material due to environmental factors and the effect of human footfall (Muir 2006). The materials to be conserved are the fired brick, mud brick, stone and lime plaster elements of the temple. For the walls and exposed upper surfaces of the architectural elements a capping system of a sacrificial* lime mortar (Durnan 2006; Historic Scotland Conservation Bureau 2003), combined with local building materials was proposed as protection against the various decay mechanisms. This practice has been used successfully by English Heritage (Historic Royal Palaces and Martin Ashley Architects 2009) on exposed architectural ruins in England and by conservators on archaeological sites in Europe, and was considered to be an effective and appropriate system for this site. An alternative approach of soft capping using earth and shallow-rooted plants was considered, but dismissed because neither the climatic conditions nor the indigenous plants suit this method of protection. During the first season the initial days on site were devoted to sourcing suitable materials for the conservation project. Sand and bricks posed no problem. 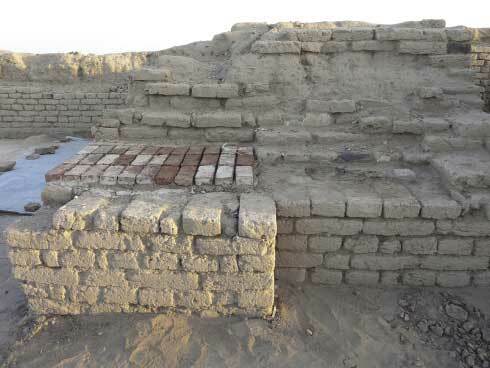 There is a plethora of sand (aggregate*) in Sudan and an abundance of fired bricks, although bricks are much smaller than the ones used in the construction of the temple. The hydrated hydraulic lime*, however, was more problematic due to confusion in product labelling, local Arabic names and wide variety of local uses. It was only after several explanations and purchases, including the acquisition of casting plaster, that these issues were clarified. As the work proceeded, the working characteristics and properties of the lime mortar mixes indicated that lime varied in quality. Test samples were prepared to determine the most appropriate mix of sand and lime for the mortar. Finally, a mix of 3:1 (sand:lime) was decided on. These proportions appeared to be sympathetic in colour and hardness to the historic material. A coarse, sharp sand was used in the preparation of the backing mortars* and scratch coats* while a fine sand was used for the finish coats and pointing*. The areas selected for testing included a range of the site’s architectural elements; an area of the missing sandstone floor; the lime-plastered sandstone walls; the capping and rendering of the exposed fired brick walls (red) and the plaster-rendered brick columns (blue/green) (figure 3). Fig. 3: Plan of the temple (Drawing by Anderson 2007). With a small team of local workers to train, a missing section of sandstone floor was the first area selected. The intention was to fill the missing area with fired bricks. Sand and soil were removed and the area was levelled to allow for a bedding mix and a brick depth to be laid. The area was well-damped and the bricks soaked to avoid rapid drying of the bedding mortar (Lee and Wood 2009). In this climate it was imperative to plan the activities of the day. When possible, work was carried out in shady areas and in the coolness of the early morning. It was important to avoid working in areas directly under the midday sun and it was essential to keep the lime mortar work covered with tarpaulins. This allowed the mortar to cure* slowly and in a controlled way. Retaining the moisture in the bricks and mortar assisted the pointing* (figures 4 to 7) (Lee and Wood 2009). Fig. 4: Area of missing sandstone floor. Fig. 5: Bedding the brick infill. Fig. 6: Pointing the bricks. Fig. 7: Finished floor area. A similar practice and approach was followed in other trial areas; bedding with combinations of lime mortars; raking out and removal of excess soil; pointing. For the wall capping and brick column, a render was applied to cover the top of the new bricks (figures 8 to 10). Fig. 8: Capping exposed walls. Fig. 9: Finished capped wall. Fig. 10: Building up the vertical wall. Subsequent seasons have allowed evaluation of the previous years’ work; this facilitates continuation of work in the trial areas and adjustment of methods and treatments, if necessary. 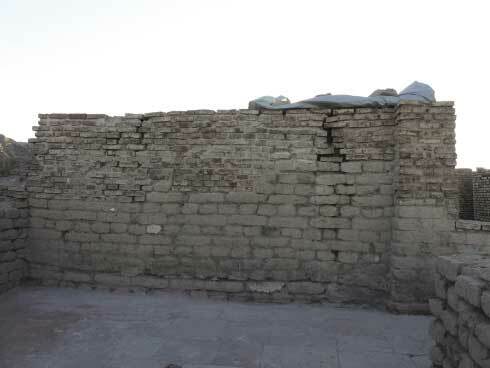 Regrettably, it was noticed that there had been some failures to the wall capping and rendered areas. The lime pointing to the brick wall capping and the brick column had been washed away by seasonal rains (figures 11 and 12). Fig. 11: Failed pointing to capped wall. Fig. 12: Failed lime render to brick column. Fig. 13: Brick and lime rendered column, 2011. Fig. 14: Capping render to column, 2011. Fig. 15: Brick capping the Kiosk walls, 2011. Fig. 16: Brick capping the Kiosk walls, 2011. 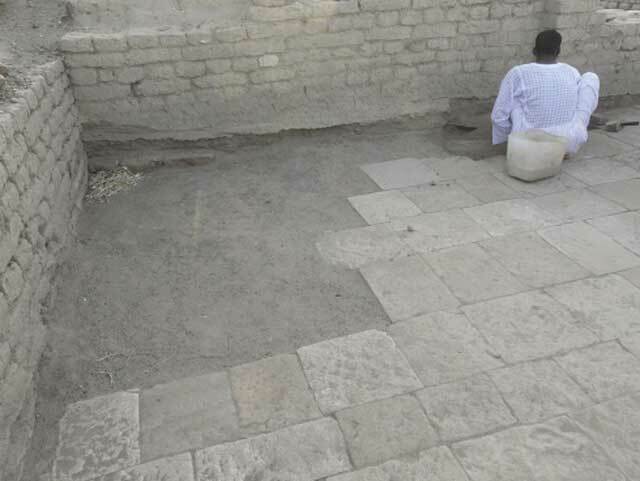 The four areas of brick infill to the temple floor had been successful and had withstood the rain of the previous season. Perplexed by the failure of the lime mortar, a sample from each of the various limes purchased in 2009 was retained to be analysed on return to the British Museum. It was hoped that these analyses would give an indication of the lime content in the mortars being used and explain the reason for failure. In the preceding season, purchasing lime appeared to be a lottery, when, as already suggested, one bag transpired to be a casting plaster (figures 17 to 21). Fig. 17: Elemental composition of sample II prepared at Dangeil. Fig. 18: Elemental composition of sample IV prepared at Dangeil. Fig. 19: Elemental composition of sample IV prepared at Dangeil. Fig. 20: Elemental composition of sample X prepared at the British Museum. Fig. 21: Elemental composition of sample IX prepared at the British Museum. However, the work continues to progress and further areas of the temple are selected for capping (figures 13 to 16). During the 2011 season we have been fortunate to employ an architectural builder from Khartoum who has experience in working with lime. He has been able to lead the local workmen and his local knowledge has helped enormously with the purchase of materials including lime fure. The same methods as in 2008 were used. Whilst it was felt that the workmen required more training in building with and using lime, it was clear that this was not the key reason for failure. The foremost reason was the weakness and absence of lime in the mortars as shown by the scientific analyses of the mortars (see below). On return to the British Museum samples of the mortars prepared in Dangeil were analysed. The recipes were not specified and samples were identified only by number. A sample of the ancient lime plaster was also analysed. The samples were imaged using a Centaurus backscattered electron detector in a Hitachi S-3700N variable pressure scanning electron microscopy (VP-SEM: 20 kV, 30 Pa). Energy dispersive X-ray (EDX) microanalysis was conducted on all uncoated cross-sections to analyse and map their elemental compositions. The analyses revealed that the lime content, as indicated by the calcium (Ca) peak, was negligible in two mortar samples prepared in Sudan (samples II and IV, figures 17 and 18). This can be compared with mortars prepared at the British Museum using the same recipes as in Sudan, but replacing the Sudanese lime with an hydraulic lime (figure 20, British Museum sample X) or a lime putty* (figure 21, British Museum sample IX). These spectra show comparable levels of calcium to Sudanese mortar sample VI (figure 19). The trials carried out are actual illustrations of what can be achieved with the restricted resources available at this remote site in Sudan. The seasons have helped the team understand what is practical to accomplish in this environment, and where there is failure, what adaptations are necessary. All the materials used in this project are readily removable and will cause no future problems to the architectural elements. These trials have helped the site directors visualise the conservation possibilities and what alterations might be essential in the future. Generally, the work carried out was successful; the local workmen had the manual dexterity to use the materials and were quick to learn their application. Scientific analyses have shown that the purchase of good quality lime is essential for the success of the capping. A great deal has been accomplished within the programme and with the limited choice of resources. If there has been one criticism of the project, it is that the appearance of the modern materials might be confused with some of the original ones. This is a debate for NCAM and the site directors. The project will continue to develop and there will be alterations to the methods and materials but these will not compromise the conservation of the archaeological remains. Aggregate: the hard filler materials, such as sand or crushed stone added to mortars or renders. Backing: the plaster or render undercoats applied to a background. Also called render coat or scratch coat. Coat: a layer or thickness of plaster or render done at one time. Cure: the setting and hardening process of a mortar mix containing a cementitious binder. Hydrated hydraulic lime: lime which has been hydrated into a dry powder. Key: a mechanical bond produced by scratching the base coat whilst wet and prepares the surface for the application of the top coat. Mortar: Any material in a plastic state which can be trowelled, cures in situ and can be used for bedding and jointing masonry. Pointing: the finished layer in the joints between masonry or bricks. Sacrificial pointing or rendering: a pointing mortar or render deliberately designed to be less durable than the masonry it protects. Slaked lime: calcium hydroxide, Ca(OH)2. Prepared by hydrating quick lime in an excess of water to form a putty. Anderson, J and Salah, M A 2010a Dangeil, à la découverte d’un nouveau temple d’Amon. In: Méroé, un empire upon the Nile. Dossiers d’archéologie 18 (Mars 2010), 50-55. Anderson, J and Salah, M A 2010b Une Nouvelle Cachette de Temple: Napatéens et Méroïtes sur la 5Cataracte due Nil’. In Andreu-Lanoë, G, Baud, M and Sackho-Autissier, A (eds.) Méroé, Un empire sur le Nil. Milan: Officina Libraria, 231-232. Anderson, J and Salah, M A 2009 What are these doing here above the Fifth Cataract?!! : Napatan Royal Statues at Dangeil. Sudan & Nubia 13, 1-9. Anderson, J 2009 Notes and News. Dangeil, Sudan. Egyptian Archaeology 34, 5. Anderson, J and Salah, M A 2008 The Kushite Kiosk of Dangeil and Other Recent Discoveries. Sudan & Nubia 12, 40-46. Anderson, J, D’Andrea, A C, Logan, A and Salah, M A 2007 ‘Bread Moulds from the Amun Temple at Dangeil – An Addendum’. Sudan & Nubia 11, 89-93. Anderson, J and Salah, M A 2006-7 The ‘Throne Room’ and Dais in the Amun temple at Dangeil, Nile State Sudan. Cahier de Recherches de l’Institut de Papyrologie et d’Egyptology de Lille 26, 29-39. Anderson, J and Salah, M A 2006a Bread Moulds and ‘Throne Halls’: Recent Discoveries in the Amun Temple Precinct at Dangeil. Sudan & Nubia 10, 95-101. Anderson, J and Salah, M A 2006b Revealing Terra Incognita: Dangeil, Sudan. Current World Archaeology 19, 23-30. Anderson, J and Salah, M A 2006c Painted Plaster: A Glimpse into the Decorative Programme Used in the Amun Temple at Dangeil, Sudan. In: Studies in Honor of Nicholas Millet (Part II). Journal of the Society for the Study of Egyptian Antiquities 32, 1-15. Anderson, J and Salah, M A 2002a Recent Excavations at Dangeil, Nile State. In: Bacs, T A (ed.) A Tribute to Excellence. Studies Offered in Honor of Ernö Gaál, Ulrich Luft, Laszlo Török. Studia Aegyptiaca 17, 45-52. Anderson, J and Salah, M A 2002b Recent Fieldwork Conducted by the Berber-Abidiya Archaeological Project. In: Welsby, D and Davies V. Uncovering Ancient Sudan: A Decade of Discovery by the Sudan Archaeological Research Society. London: Sudan Archaeological Research Society, 44-45. Anderson, J and Salah, M A 1998-2002 Archaeological Reconnaissance in the Berber-Abidiya Region. KUSH: Journal of the Sudan Antiquities Service 18, 25-34. Durnan, N 2006 Limestone. In: Henry, A (ed.) Stone Conservation: Principles and Practice. Shaftesbury: Donhead, 183-184. Historic Royal Palaces and Martin Ashley Architects 2009 Lime and Lime Mortars in the Conservation and Repair of Historic Buildings. The Importance of Using Lime. Museums and Heritage Magazine 2. Historic Scotland Conservation Bureau 2003 Technical Advice Note 1: Preparation and Use of Lime Mortars (revised edition). Historic Scotland Technical Advice Notes. Edinburgh: Historic Scotland. Kemp, J 2006 Marble. In: Henry, A (ed.) Stone Conservation: Principles and Practice. Shaftesbury: Donhead, 231. Pavía, S and Bolton, J 2000 Stone, Brick and Mortar: Historical Use, Decay and Conservation of Building Materials in Ireland. Wicklow: Wordwell, 253. Salah, M A and Anderson, J 2005 Le temple d’Amon à Dangeil (Soudan). Bulletin de la Société Francaise d’Égyptologie 162, 10-27.